In another thread Fred gave me some directions on what the different heads where portraining, but I didn't really understand where they where placed. Here is picture with a number for each knekt. If Fred or anyone could tell me which ones where turks, roman soldiers and so on it would be a big help. Cheers Fred, that will be helpful! That's not a helmet and laurel wreath, it is a turban. Thanks Fred. In the above pictures there looks like an even surface with a knob on the head. Is the turban combined with a turkish helmet perhaps? When looking at old turkish helkets, many had a pointy shape with a knob. That might be the case, and some Ottoman troops wore a helmet/turban combination. This knight has that arrangement, but the fore halliard knight, which is also a Turk, has a cloth turban only. Thank you very much indeed for taking the time Fred! I feel like I should bring you a bottle of wine or something next time I go to the museum. You are most helpful to us. Lagavullin scotch or American rye whiskey, please! Haha, ok as nice as Rye is I still have to go with the scotch then. Hey, aren't you two guys the moderators who should be telling us to take this whiskey discussion to the general board? Ha! Well I guess I am a pretty laid back moderator. Back to Vasa topics! You two certainly know to what you are referring when you say 1 through 7, but I am puzzled. Are these locations notated on someone's drawing? 1. The knight for the mizzen halliard, just before the mizzenmast at the break of the quarter deck. 2. The knight for the main topsail halliard, at the starboard, after corner of the hatch abaft the mainmast. 3 & 4. 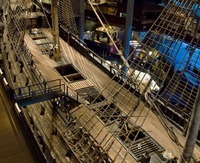 The main topsail sheet bitts with crossbar, directly abaft the mainmast. 5. The knight for the fore halliard and toprope, at the starboard, forward corner of the hatch abaft the foremast. 6 & 7. The fore topsail sheet bitts with crossbar, directly abaft the foremast.